Members of the State College community will come together on this week to celebrate the 55th anniversary of the historic 1963 March on Washington for Jobs and Freedom. A special program will be at 5 p.m. on Tuesday at the Martin Luther King Jr. Plaza, 127 S. Fraser St. The 1963 March on Washington was held in the nation's capital to bring attention to civil and economic rights for African-Americans. On that day before an estimated crowd of 250,000 people in front of the Lincoln Memorial, Martin Luther King Jr. delivered his "I Have a Dream" speech, a vision for a nation free of racism. One of the largest political rallies for human rights in U.S. history, the march is credited with helping to pass the Civil Rights Act of 1964. On Tuesday, State College Borough will present a program of music, dance and poetry to commemorate the anniversary of the march. Following opening remarks by Mayor Don Hahn, the event also will include a presentation of the Black National Anthem by Jessica Henry, assistant professor of education at Penn State, as well as performances by Roots of Life Dance Troupe and singer-songwriter Eric Ian Farmer. Gabriel Green, graduate student in African American and Diaspora studies at Penn State, will perform a spoken-word piece. Other participants will include Sarah Q. Malone, convener for Interfaith Initiative Centre County, and members of State College’s Community Diversity Group. State College renamed the Fraser Plaza in honor of King in 2012 and with help from a citizen advisory committee later redesigned the area to commemorate King and serve as a public gathering space. 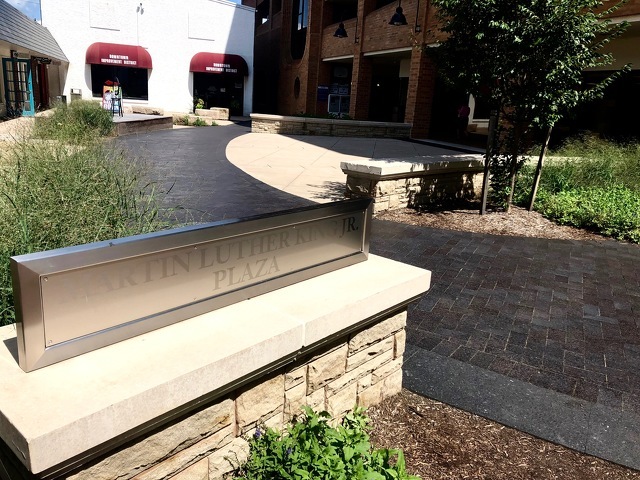 Tuesday's event also will celebrate the one-year anniversary of the ribbon-cutting and dedication for the redesigned plaza. Markers remember significant moments from King's public life and the plaza includes a prominent mural with images from King’s Jan. 21, 1965 speech at Penn State’s Rec Hall before 8,000 people. “Out of the many memorials to King around the nation and world, there are not many outside of key civil rights cities in the South -- Birmingham, Atlanta, Memphis and others -- that extend beyond a street name, a mural/image, or maybe a quote,” said AnneMarie Mingo, assistant professor of African American studies and women's, gender and sexuality studies at Penn State. 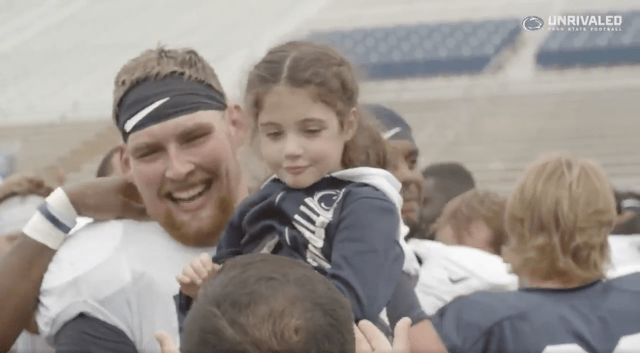 Surprise scholarship announcements are one of the best things to come out of college football training camps, but Penn State took its announcement of offensive lineman Charlie Shuman’s scholarship to another level.